For convenience sake’s we’re reading newspaper rock from top to bottom and from left to right more or less. Though it goes without saying that this was not the way these glyphs were put down or meant to be read. And I’ll agree that it is somewhat presumptuous of me to claim to be able to the read newspaper rock. That being said it is without a doubt that these symbols had meaning to the individuals that put them there and no doubt to other members of their culture. I think it’s only proper to give some account of my qualifications to these interpretations of newspaper rock. To start with I have done a fair amount of hunting in the Southwest at one point guided hunts for desert Bighorn sheep. One of my mentors emphasized to me if you really want to be a good Hunter and understand what it means you must study archaeology. The reason for this is that archaeology is largely the study of hunters and gatherers. 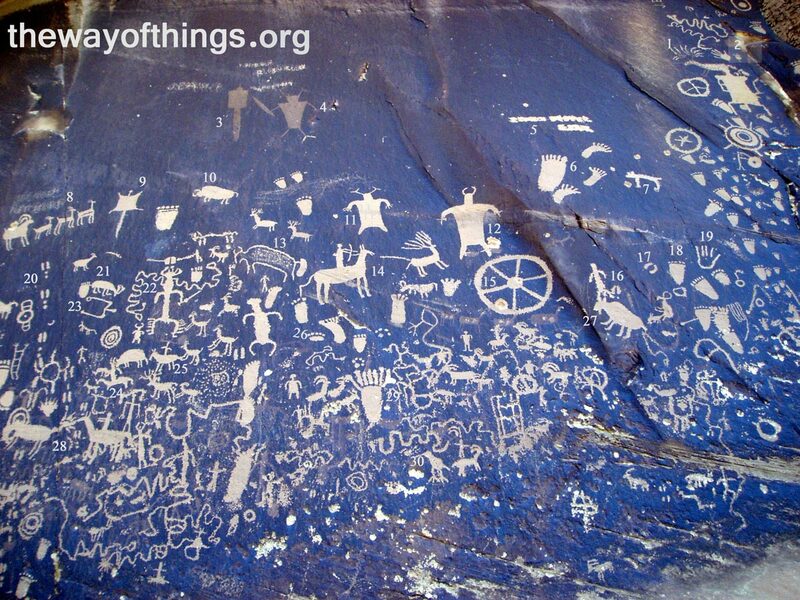 So through the years I developed an interest in petroglyphs and in particular the great basin style. This should guide the reader as to my insights and prejudice in these interpretations. The human hand is a common glyph throughout the world and it is often associated directly with the individual human being that put it there. In this case there is some evidence that this is the case with this hand print. It is from the left-hand and of course most people draw with right-handed. Some ancient deity or shaman in ceremonial regalia wielding some sort of club or stick, this glyph and number three look much older than most of the other glyphs on this panel. This individual seems to be wearing a similar headdress to the one on number 11 which would seem to indicate that this deity or shamanistic ritual lasted a long time because number 11 looks much newer. A modern addition to newspaper rock. While these kinds of additions are not welcome, there is still little bit of knowledge to be gained from them. If we look closely we can see a slight color variation in this glyph from the other. That because it's so new. Through the passage of time all of these glyphs will fade. While these are obviously human footprints some of the footprints on this panel are confusing as to whether they are human or bear. Another interesting thing to be aware of is that most footprints are the natural symbol for the species that made them and this includes humans. However, in petroglyphs in North America, the footprint is rarely used to indicate humans but rather some sort a stick figure is likely to be used as elsewhere on this panel. This glyph is most likely a Bobcat and that's indicated by its perky ears and short tail. Then if we pay more attention to detail we know that a Bobcat generally has large feet for its size and that seems to be indicated on this glyph. This almost photograph like picture of a large ram following a group of ewes probably has more to do with fertility than hunting. This is another stretched out hide. Using the small head and the long tail to guide, this interpretation is most likely a ringtail cat, although one can never be sure. This is obviously a buffalo. I don’t know if buffalo ever occurred naturally in the vicinity of newspaper rock but it’s certainly possible. Judging by the number of buffalo on this panel the ancient hunters of this area certainly thought very highly of the buffalo, and of course for these ancient hunter gatherers the buffalo would’ve been a challenge to hunt and could provide a lot of good tasting meat and a very valuable hide. One of many ancient shamans or deities on this panel as was noted earlier, this tradition seems to be part of an ancient local tradition and so one might assume it is connected to a powerful and common part of the local environment, but it is really difficult to identify definitely it’s headdress The only thing that comes to my mind is that it might be artistically distorted and if so it might be an antelope headdress. This is somewhat curious because the antelope is a relatively common animal in this area yet is not represented on newspaper rock. Perhaps the antelope due to its small size and being relatively common. Was not considered a trophy animal and therefore does not have a prominent place on what might be called trophy room rock. This is obviously a shaman wearing a buffalo headdress and judging from the thickness of the body this individual may be also wearing a buffalo hide robe. And he is not the only human wearing this type of headdress on newspaper rock. The fact that we have both buffalo and shamans wearing buffalo headdress on this panel it is very likely that they hunted buffalo in the immediate vicinity, due to the fact most hunter gatherer societies could not carry any quantity of meat or hides for distances more than a few miles. However toward the end of this culture these people had horses and so they could range widely for the resources they wanted. While this is obviously a buffalo, it has some unique features that should be noticed. The most obvious is an attachment to its rear end which I believe most likely is a representation of a calf still in the embryonic sack. This makes it a fairly unique glyph. Also one should notice it has a different artistic style than anything else on this panel and perhaps was done by a woman, thus having more to do with fertility and rebirth. In most ancient societies this would have be seen as a natural part of hunting and magic. There are also some artistic similarities to the hand print number 19. One of the most fantastic glyphs I’ve ever seen. There is so much here that I don’t even know where to start. Perhaps we should start with the basics. Anytime you see a glyph of a horse and rider it is a very unique glyph. There was only a short time when these petroglyphs were being made while the Indians had horses and so it represents a unique and thin slice of time. Then of course there’s the deer. If this deer existed in reality he would certainly make the record book. We can see that these ancient people were doing a little bragging on trophy room rock. But this of course is not a static glyph. It is an action scene. The rider is packing a bow and arrow and has just shot this deer in the rear. This glyph has amazing details if one looks closely. To start with, the deer is shown tense with its head drawn back feeling the shock and the pain from the impact of the arrow. The horse has a much more relaxed yet tentative posture. Then this artist included the horror film like detail of actually showing blood squirting out the deer’s rear end. It’s hard to say whether this glyph was made as a serious hunting scene or perhaps in jest. Even today a modern hunter would not brag about shooting a deer in the rear end. Then there’s the issue of hunting on horseback. Sometimes it takes little or no skill to do this, as deer and other animals only see the horse and not a dangerous predator, allowing one to get very close, very easily. This makes this a scene of insult and injury to this magnificent deer. In our modern world this story would go something like this. A modern hunters would call this road hunting. This is where you drive up and down the road to spot a deer and don’t even bother to get out of the car or saddle to shoot. Sometimes one of the modern hunting shamans perhaps wearing his own version of ceremonial regalia that is “the game warden in his uniform” will find out about this and hold counsel with this person and then provide for a “cleansing ceremony” that is to pay a fine. But perhaps in ancient times it was considered good enough to be humiliated for time immemorial. Well this is just one interpretation I’m sure there are others. This wheel, while this looks like a wagon wheel, I doubt very seriously that’s what it is. All the Native Americans took to the horse yet they really didn’t take to the wheel. I know of no known incident where the Native Americans producing their own wheeled vehicle. I believe its large size compared to other glyphs is significant. I think most people that know glyphs would consider it a medicine wheel. Without a doubt the traditions of the medicine wheel go back thousands of years and is still part of some Native American cultures. This hoofprint is most likely the print of a deer or an elk. Since it has dew claws it is almost certainly a large male. This is in keeping with male and hunting symbolism throughout this panel. This is most likely the hoof print of a desert Bighorn sheep and one can wonder if it has any association with number 16. This is without a doubt the hind foot print of the bear but other places on this panel they are not as easy to identify as to whether they are human or bear. Many of them have extra digits, and one can only wonder as to what is the meaning of this, if any. While this is obviously a human hand, it is in my experience truly a unique style of art as far as petroglyphs go. The fact that the fingers are not connected is similar to the legs on number 13. One cannot be really sure just what these are but I’m willing to speculate that there a deer showing the hoof and dew claws in a Picasso manner. That is, all the elements are there but there arranged in an unnatural manner. Perhaps some shaman was into peyote or the sacred datura. This is a medium-size ram in the head down position eating or drinking. This shaman in fancy pants. It is significant that he appears to be holding an adalatl. That is a device for throwing a spear with greater power and distance. This was a technology used before the bow and arrow and perhaps was used long after the bow and arrow was invented. It tends to have a lot more power than a hand thrown spear and this is useful with big-game. Not much to go on, this is most likely a mountain lion, and what indicates that is its long body and tail. Here is another horse and rider. If you look close, this one seems to have a horned headdress, perhaps that of a Bighorn sheep. This may have been a very memorable spectacle in real life and so it made the newspapers. This is the print of a bears front paw. It is hard to tell if this is in association with the other prints around it. Low into the right of it there seems to be the print of a bobcat or mountain lion. This is a buffalo possibly associated with the human figure and showing a little bit of a beard that is common among big male buffaloes. This is another action scene with the horse and rider. In this case the rider has both hands facing forward but doesn’t seem to have any kind of weapon. In front of him is a bighorn sheep, and I’m not sure if he’s also gotten hit by something, or is there just some other glyph between them. I’ve heard of road hunting deer before but never bighorn sheep. The terrain they generally occupy would make this much harder to do. This is a bear print with big scary claws. One can only speculate that somebody faced this bear and wanted to tell everybody about it. I think it’s quite possible that this records an incident between a particular human being and a particular bear immortalized in stone. While this is obviously a bird, it is no ordinary bird. This of course is a snipe. Here we can see the snipe hunting is not only ancient, but these ancient hunter gatherers put snipe hunting on par with bighorn sheep and buffalo hunting. So If you ever get an invitation by somebody that still practices the ancient and time-honored sport of snipe hunting. You should consider your participation a honor and an opportunity. In our day and age any well read person knows that the newspapers don’t cover everything that happens. And so it is with newspaper rock. There are no images of corn or pottery or anything else indicate that there was farming going on in this area. Yet there was a well-established farming culture in this area. There is perhaps two possibilities one that these local farmers went hunting and recorded their hunting exploits here on newspaper rock/trophy room rock. Then the other possibility is that there was a hunter gatherer culture that lived in this area simultaneously with the indigenous farming culture. This of course is just one of many mysteries left to us by these ancient people. In this lecture I discuss why learning the night sky can assist one in acquiring information usable while out in the field.